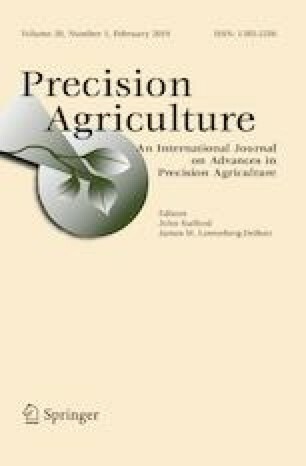 In precision agriculture (PA), compact and lightweight electromagnetic induction (EMI) sensors have extensively been used to investigate the spatial variability of soil, to evaluate crop performance, and to identify management zones by mapping soil apparent electrical conductivity (ECa), a surrogate for primary and functional soil properties. As reported in the literature, differential global positioning systems (DGPS) with sub-metre to centimetre accuracy have been almost exclusively used to geo-reference these measurements. However, with the ongoing improvements in Global Navigation Satellite System (GNSS) technology, a single state-of-the-art DGPS receiver is likely to be more expensive than the geophysical sensor itself. In addition, survey costs quickly multiply if advanced real time kinematic correction or a base and rover configuration is used. However, the need for centimetre accuracy for surveys supporting PA is questionable as most PA applications are concerned with soil properties at scales above 1 m. The motivation for this study was to assess the position accuracy of a GNSS receiver especially designed for EMI surveys supporting PA applications. Results show that a robust, low-cost and single-frequency receiver is sufficient to geo-reference ECa measurements at the within-field scale. However, ECa data from a field characterized by a high spatial variability of subsurface properties compared to repeated ECa survey maps and remotely sensed leaf area index indicate that a lack of positioning accuracy can constrain the interpretability of such measurements. It is therefore demonstrated how relative and absolute positioning errors can be quantified and corrected. Finally, a summary of practical implications and considerations for the geo-referencing of ECa data using GNSS sensors are presented. This study was supported by the Federal Ministry of Education and Research (Competence network for phenotyping science-CROP.SENSe.net). The contributions of B.P. Marchant are published with the permission of the Executive Director of the British Geological Survey (NERC). Brevik, E. C. (2001). Evaluation of selected factors that may infl ue nce the application of electromagnetic induction technology to soil science investigations in Iowa. Retrospective Theses and Dissertations, 416. http://lib.dr.iastate.edu/rtd/416. National Marine Electronics Association. (2012). NMEA 0183, The Standard for Interfacing Marine Electronics. Retrieved May 01, 2017, from https://www.nmea.org/content/nmea_standards/nmea_2000_ed3_10.asp.